Tarantox is one of the bosses in Super Mario Galaxy. It is found wrapped up in a web inside the Phantom Boss Spider Zone in the Space Junk Galaxy. Its name is a portmanteau of the words tarantula and toxic. The music while fighting Tarantox is the same as while fighting Dino Piranha and Fiery Dino Piranha. Mario reaches it by using a Sling Pod to break the shell off of the Phantom Boss Spider Zone, revealing its web and the spider in a cocoon. Mario then must use another Sling Pod to tear the web and free the spider, then battle it. 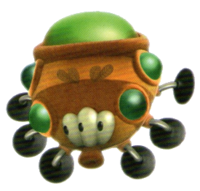 Tarantox resembles a combination of Spider from Yoshi's Story and a Scuttlebug from New Super Mario Bros. It has three wide oval eyes, wings, and a Snifit-like mouth. Its feet are similar to suction cups. It has horizontal stripes on its body and five glowing buttons on its sides, one much larger than the others. It attacks Mario by flailing its legs around and spitting acid from its smaller buttons. It also has three large buttons on its underside, which Mario must pop. This battle practices using Sling Pods. To defeat the spider, Mario must use Sling Pods and throw himself at the largest glowing button (the one on Tarantox's rear) to pop it. Mario can also sling himself at Tarantox's eyes, which will cause the boss to cover his face in pain, rendering him stunned for a very short period of time. The spider will fall upside down, revealing three more red bumps on its underbelly. If Mario pops all of them, the spider regains its feet and attacks faster. During the second round the side glowing buttons start blasting toxic liquid so it is harder for Mario to hit Tarantox. 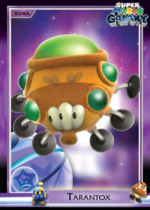 If Mario repeats the procedure one more time, Tarantox falls through its web and goes flying into space, revealing a Power Star which Mario has to use a Sling Pod to get to. A giant, triple-eyed space spider in the Space Junk Galaxy, Tarantox is a formidable boss Mario must battle for a Power Star. Reach the acid-drooling arachnid by sling-podding into its web. Catapult Mario into Tarantox's weak spot (the orbs on its back) to flip the spider on its back. Continue to hit the ones on its belly to hurt it. Do this twice to win the Power Star! In the Super Mario Mash-Up Pack in Minecraft, Cave Spiders are replaced by Tarantox. Spider eyes are replaced by Tarantox's eyes. This page was last edited on December 17, 2018, at 23:25.